Alpha Pillow And Throw Set Just $7! Down From $13! At Walmart, you can score this Alpha Pillow And Throw Set for just $7 down from $12.88 PLUS FREE store pick up or FREE shipping for orders $35 or more! Stare deep into the wolfs eyes on this American Heritage Collection Alpha Pillow and Silk Touch Throw! 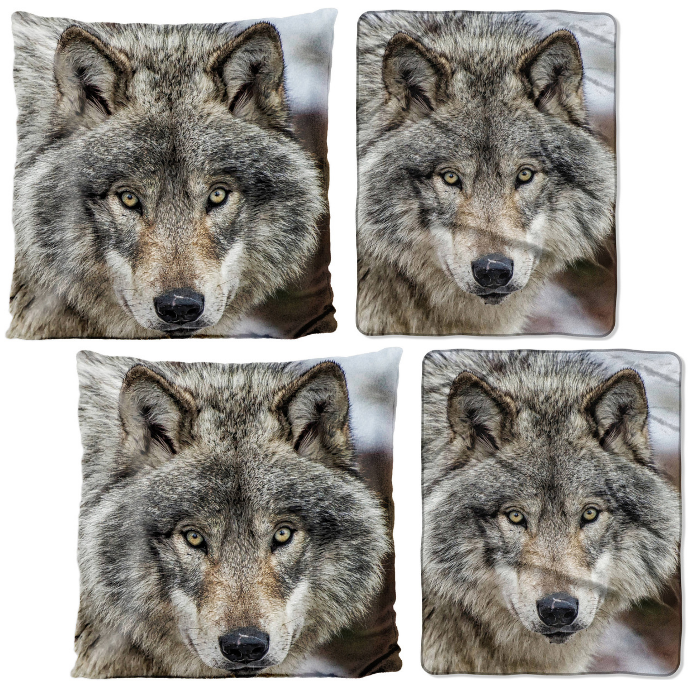 This bold, colorful, and extremely soft pillow and throw set is designed with an artistic flair that depicts the face of a gorgeous wolf with a mix of white, brown and black fur. The material of this throw is silky soft, warm, and known for its rich, saturated colors. With exceptional durability, this 48x 60 throw and 16 square pillow set can be used in the bedroom, as decorative couch accessories, or outdoors on a picnic. Throw is machine washable and pillow is spot clean only. 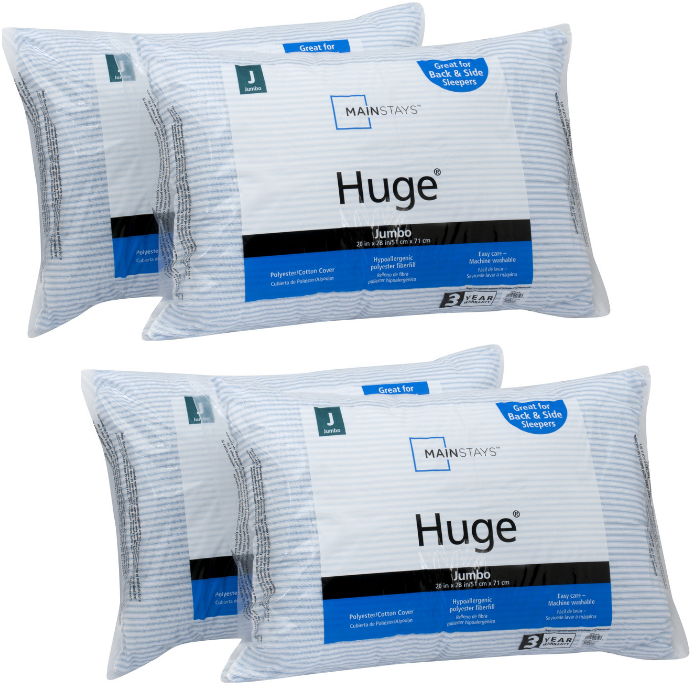 Mainstays Microfiber Pillow 2-Pack Just $5.60! Head over to Walmart where you can score this Mainstays 100% Microfiber Pillow Twin Pack for just $5.60 (or $2.80 each) down from $8 PLUS FREE store pick up or FREE shipping for orders $35 or more! Looking for soft and comfy pillows? Go for the Mainstays 100% Microfiber Twin Pack Pillow is perfect for people that sleep in any position. These white pillows are very soft and are made with 100% polyester microfiber shell to offer ultimate comfort and softness. These pillows are great to sleep on or to even use for sham stuffers when decorating your bed. It is filled with 100% hypoallergenic polyester fiberfill for support. This hypoallergenic polyester filled pillow is highly durable and provide softness and comfortable support for any sleep position. 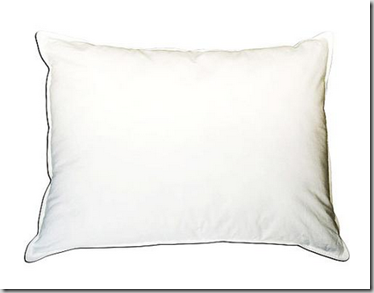 The Mainstays Microfiber Twin Pack Pillow can be machine washed and are easy to clean. Hola Decorative Pillow Just $7.97! Down From $16! 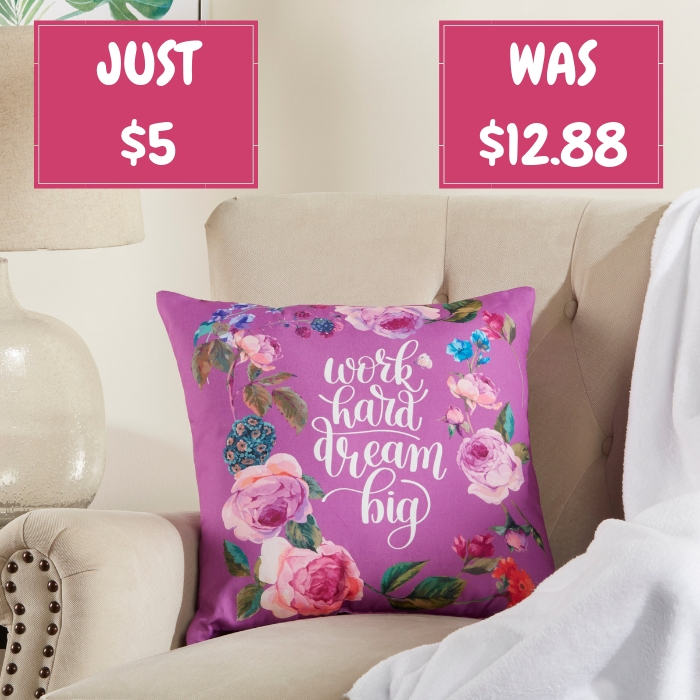 Head over to Walmart to score this Hola Decorative Pillow for just $7.97 down from $15.62 PLUS FREE store pick up or FREE shipping for orders $35 or more! 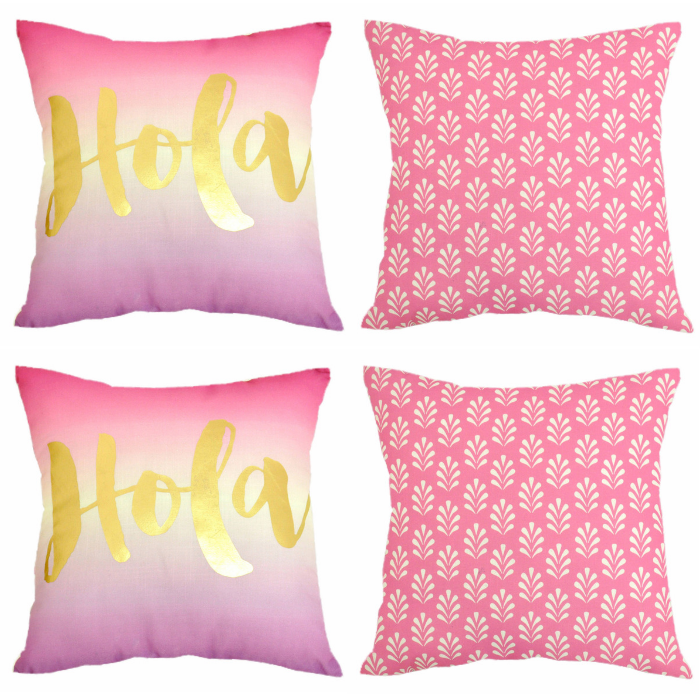 Instantly upgrade your room and give it a new look with this Formula Hola Motif Decorative Pillow in Pink and White. This pillow is squishy and super-soft. Made of durable polyester fabric and soft polyester fill for maximum comfort, it is a perfect resting piece and wonderful decoration piece to your chateau. Designed with uplifting words such as Hola on one side and crafted with motif prints on the other side making this decorative and inspiring pillow a must have in every home. This Formula Hola Motif Decorative Pillow in Pink and White is creatively designed for your outmost comfort. This decorative pillow is made with quality to ensure it stands up against daily wear and tear. Just use a damp cloth for simple care. Mainstays Pillow 2-Pack Just $7.25! Down From $13! At Walmart, you can score this Mainstays Pillow 2-Pack for just $7.25 down from $13 PLUS FREE store pick up or FREE shipping for orders $35 or more! The Mainstays Huge pillows will be a great way to freshen up your bed, with the blue and white stripe pattern. These pillows are sold in a set of 2. Get a comfortable, good night’s sleep with Mainstays Huge pillows. The Mainstays Huge pillows are ideal for all side sleeping positions. These pillows make great sleeping pillows or even sham stuffers if you are looking for new comfortable pillows to sleep on or simply looking for pillows to stuff your shams. The Mainstays Huge pillows have 52 percent polyester / 48 percent cotton shell with 100 percent hypoallergenic polyester fiberfill. These pillows will fit in standard size pillowcases, queen size pillowcases or standard/queen pillowcases. The Huge pillows are ideal for side sleeping positions. The hypoallergenic, machine-washable polyester fiberfill makes them durable and comfortable. Freshen up your bed with Mainstays Huge pillows. These pillows will fit in standard and queen size pillowcases. Mainstays Navy Be U Pillow Just $5! Down From $10! Head over to Walmart where you can get this Mainstays Navy Be U Pillow for just $5 down from $10.49 PLUS FREE shipping for orders $35 or more! 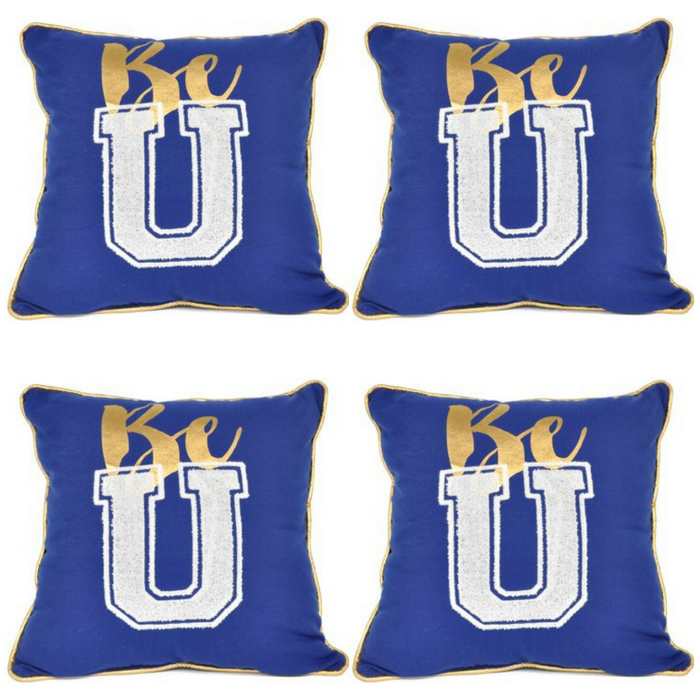 This Mainstays Navy Be U Decorative Pillow is perfect for going back to college. The fun and bright colors coordinate well with room dcor and different color palettes. The Mainstays Navy Be U Decorative Pillow has a coordinating trim to match the logo print. The fun and stylish decorative pillow will make your room or dorm room fun and colorful. 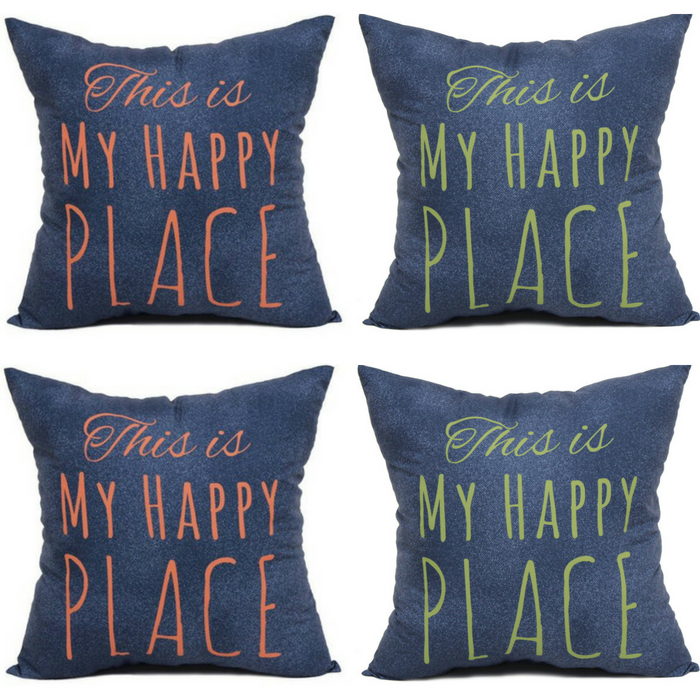 Mainstays Happy Place Pillow Just $5.97! Head over to Walmart where you can score this Mainstays Happy Place Pillow for just $5.97 PLUS FREE store pick up or FREE shipping for orders $35 or more! The Mainstays My Happy Place Pillow is a fun, whimsical pillow that is sure to brighten any room. It will serve as a perfect accent piece to the decor of your home. The pillow is soft and comfortable. Full Body Maternity Pillow Just $24.99! Down From $62! Head over to Walmart to score this Full Body Maternity Pillow for just $24.99 down from $61.88 PLUS FREE shipping for orders $35 or more! During pregnancy finding a comfortable sleeping arrangement can be a challenge. Full Body Maternity Pillow with Contoured U-Shape by helps alleviate discomfort by providing support to the unique shape of pregnancy with a unique contoured shape of its own. Multiple pillow configurations allow moms to find comfort no matter how they choose to sleep, whether it’s on their back, side or otherwise. Sleep peacefully throughout the night gently supported by the Full Contoured Body Pillow. Mainstays Knot Pillow Just $12! Down From $25! Head over to Walmart to score this adorable Mainstays Knot Pillow for just $12 down from $24.99 PLUS FREE store pick up or FREE shipping for orders $35 or more! Add fun and beauty to your interiors with this Mainstays Pretzel Knot Pillow that you and your guests will love. The 10.5″ diameter knot pillow design is a unique must have to add detail to your decor. The knot pillow is both stylish and comfortable. Add this Mainstays Knot Pillow to any bedroom, play room, living room, or nursery. The soft and machine washable fabric is perfect to add to any interior space. Available in many colors, this Mainstays Knot Pillow can match most decor and color palettes throughout your home. Mainstays Green Floral Throw Pillow Just $5! Down From $15! Walmart is currently offering this Mainstays Green Floral Throw Pillow for just $5 down from $14.97 PLUS FREE store pick up or FREE shipping for orders $35 or more! Brighten your decor with the vibrant Mainstays Green Floral Throw Pillow! 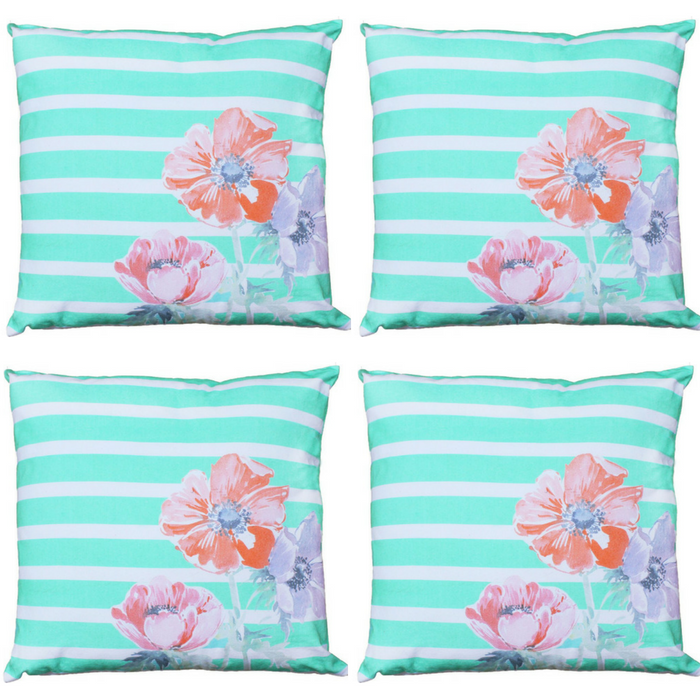 Each pillow features a printed floral and stripe design on the front with a solid back. Love it! 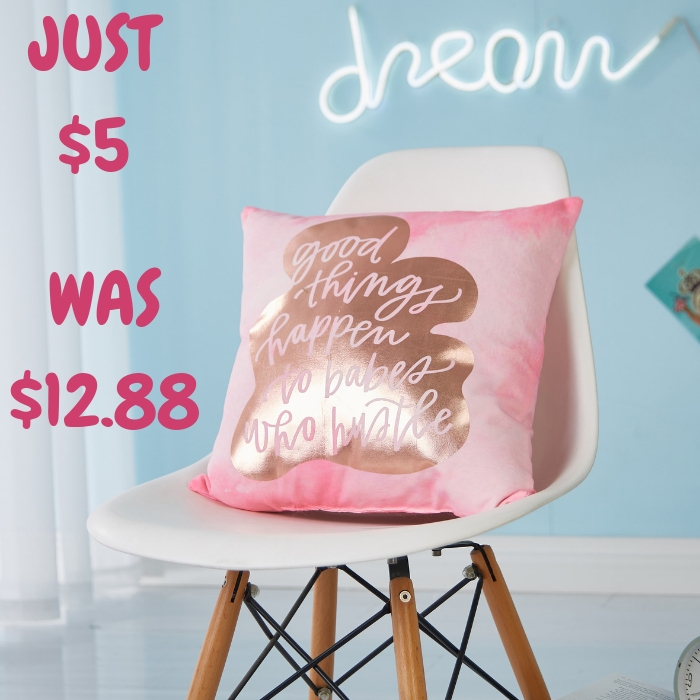 Mainstays Dreamer Throw Pillow Just $5! Down From $15! 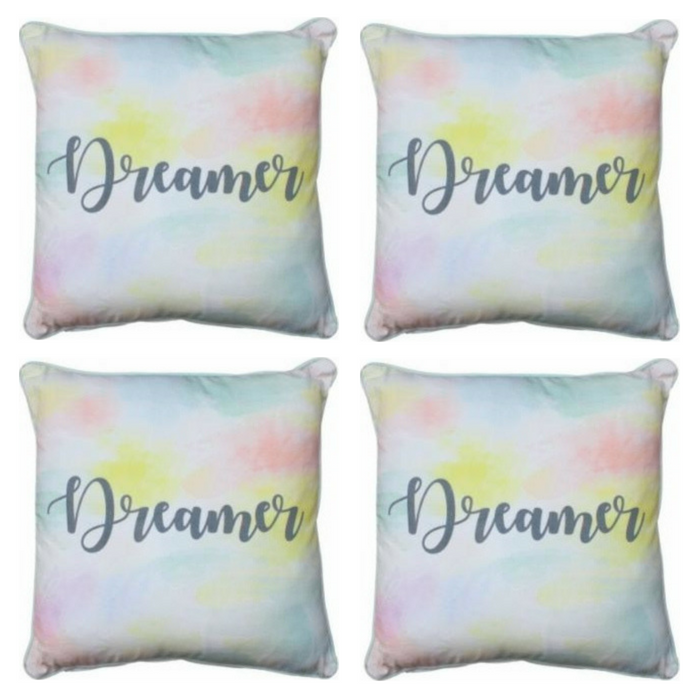 Walmart is currently offering this Mainstays Dreamer Throw Pillow for just $5 down from $14.97 PLUS FREE store pick up or FREE shipping for orders $35 or more! You’re gonna love this throw pillow with its bright watercolor print on it. Nice and vibrant! Perfect addition to your pillow collection! 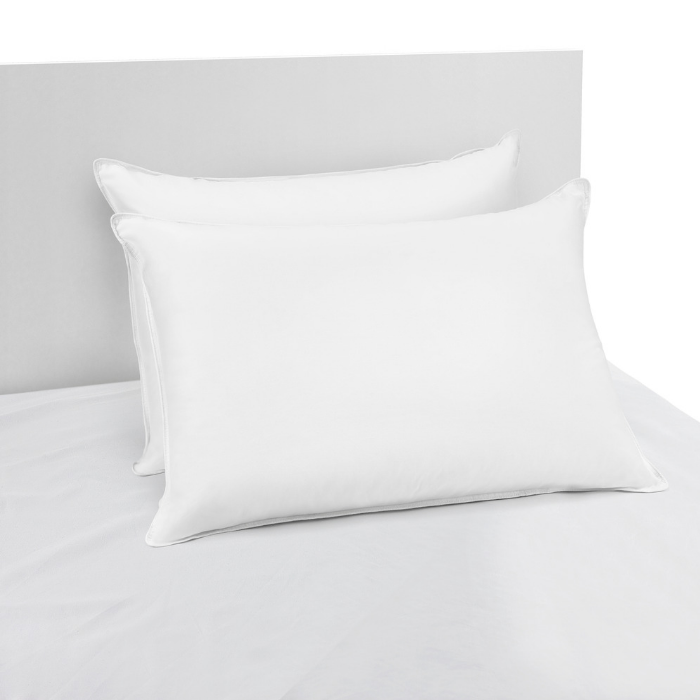 Walmart.com Deal: 200 Thread Count Pillow Just $7.81! Walmart has a 200 Thread Count Pillow for $7.81! That’s an incredible deal and you can have it shipped to your local store for FREE!